Set in a sheltered wooded valley it has several unique features, including the serpentine maze which, when viewed from the opposite side of the valley looks like a giant coiled serpent lying up the sloping garden. The valley was bought by Alfred Fox in 1820 and he had the unpretentious creeper-clad house built for the family, who still reside in the private residence. Alfred then turned his attention to creating a suitably befitting garden. and those returning from Africa, the Far East and Asia. This allowed him to import all manner of exotic trees which have survived almost two centuries of Cornish winters! Tulip trees, a Japanese loquat, a weeping Mexican cypress, bamboo, gunnera, tree ferns and a multitude of tender camellias, magnolias and rhododendron species have flourished and now make a splendid show all year round. 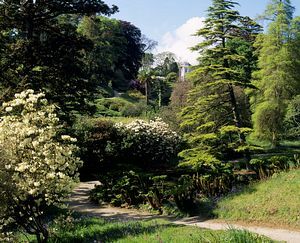 Alfred Fox wove a design of winding paths down the sides of the sloping valley and created the gardens in the fashionable romantic style of the 1820s and 30s. 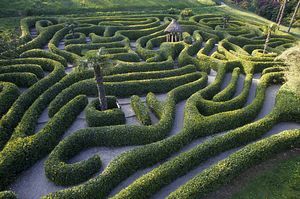 Finally he planted the cherry laurel maze of silver-grey foliage in the unusual serpentine form best viewed from the facing valley. Spare a thought for the gardeners who have to trim the miles of hedge that the maze consists of! The gardens continued to be enhanced by the following three generations of the Fox family creating a splendid garden of individual character and beauty. of heaven, a crown of thorns (euphorbia) and a Judas tree. These are in contrast to the open spaces which encourage wild flowers to bloom in season - bluebells, primroses, columbines, Easter lilies and the dogwood species "Bentham's cornel". The winding garden paths and boardwalks continue beside running streams down to the coast and the tiny fishing haven of Durgan. The small fishing boats make a wonderful picture, drawn up on the beach beside the Helford River. For children it is the perfect place to end the visit, building sandcastles, watching the boats or skimming stones. Although the family has retained the estate house and use of the gardens on Sundays and Mondays, the gardens were gifted to The National Trust by Cuthbert and Philip Fox in 1962. Head gardener Steve Porter leads the team of gardeners who are charged with keeping the gardens in such splendid condition. 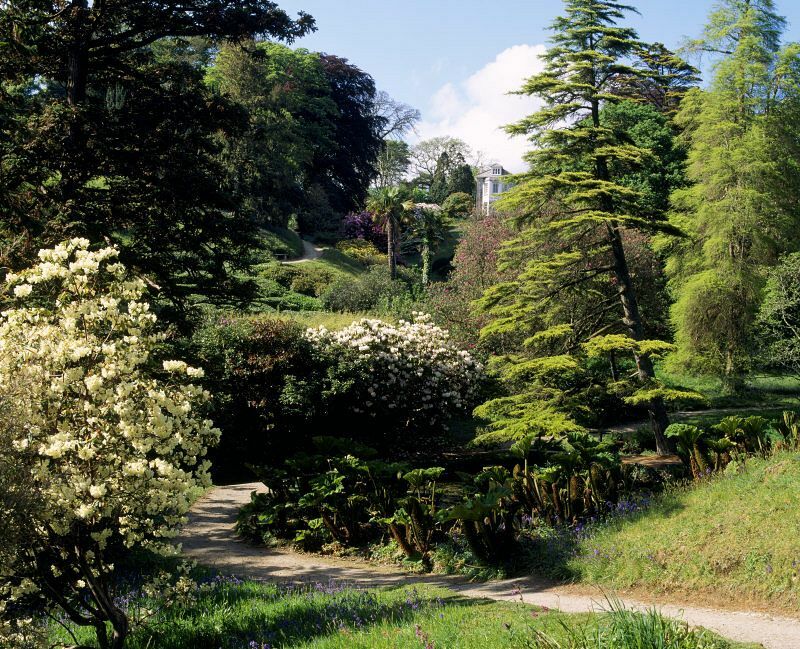 There is a shop and café to complete your day out at Glendurgan. Sample a cream tea or pick up a plant to take home to remind you of your day at these splendid sub-tropical gardens. Link between Helford Passage (1½ mile walk from Durgan) and Helford Village on south side of Helford River. 4 miles south west of Falmouth, ½ mile south west of Mawnan Smith, on road to Helford Passage. South West Coast Path within ¾ mile.